Spoon Pot Clip How many times have you wiped and rewiped messy drips from your stovetop or counters? Well, no longer! 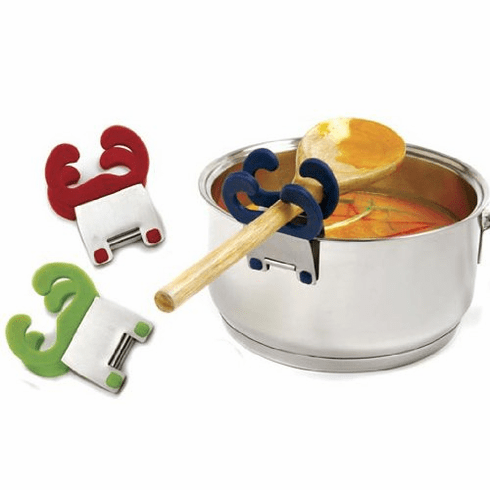 The Spoon pot clip, is a must have for all cooks. A practical, space and sauce saving little utensil...it'll make you wonder how you got along without it. The Utensil Pot Clip securely attaches to the edge of most cookware, and will hold your spoon, spatula, fork or most utensils. Any drips will just fall right back into the pan...where they should be in the first place. Great way to save space, waste less and make clean up a snap! Professional Gauge stainless steel frame. High heat silicone pads clip onto the pot/pan. Spoon/spatula drips directly into pot and utensil handle stays cool. Colors sbject to availability. Price per clip.